I'm working on my post about pineapple chicken and pineapple upside down cake, but my pictures are downloading as complicated gibberish code instead of image. You are all so smart; can you tell me what I'm doing wrong? Computer troubles reveal my true nature as a Flintstone. I'm tempted to throw a rock at my computer and see if that would fix it. It hasn't worked yet. Anyway, I'm too chipper to let it get me down today. 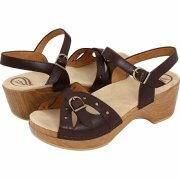 This last weekend I was out looking for shoes when I spotted these stunners from Dansko. Hopefully you will see a pair of shoes, and not the scrambled jibberish I was referring too earlier. Can you see them? " "Too much moolah, but very cute," I told my sister, Heidi. She blabbed my secret yen to my littlest sister Mary Kate, the one with five kids that I just babysat while she was in the Cayman Islands. As a thank-you present, she suprised me with the shoes I'd been admiring. I love their comfort, their stylishness, their pretty straps, but mostly I love that my two sisters conspired to suprise me. I'll be back later today, after I throw a second rock at the computer. Happy Monday. I'm not sure, but this could be your problem . . . When you're writing your post, make sure that the tab at the top right corner (just above "preview" is on "compose" and not on "edit html". Very cute shoes! It sounds like you have two fabulous sisters! I was more than happy to buy a thank you gift for your kindness. Babysitting 5 children (young children at that) deserves some type of reward. Thanks again for being so great! It really was the best trip ever. What a nice present. Cute shoes.